The best of Cambodia and Vietnam deliver the highlights of both countries are to open your eyes. Discover the wonders of Angkor watt and then start off in charming Hanoi, and continue to see the heritage sites in Halong bay famed dramatic karst scenery, the last emperors in Hue and the old-world charm of Hoian and the endless energy of Saigon and last discover the lovely Mekong Delta with sweet local people and lush canals …. Upon arrival, you will be picked up by the tour guide and a driver at the airport and transferred to your hotel. Start the day with a transfer to Angkor Wat, one of the modern wonders of the world. Be amazed by the sheer size of the temple and learn how the Khmer Empire prospered between the 9th and 13th centuries, around the time when Angkor Wat was built. Stroll through the intricately carved hallways that show hundreds of fine carvings and discover small shrines still in use today by the local people. Enjoy a private gourmet picnic lunch in a wonderful setting at the local home of a Khmer family within the Angkor complex. You may have chance to meet with the house owner and take a quick look around the community. Your table and food are set up on the balcony of the house where a butler will serve your every needs. Optional: after lunch, opt for a walk of 30 minutes through the community to the back entrance of Ta Prohm. See handicraft making workshops away from any crowds and how people live their rural life in the midst of ancient ruins. Continuing to Angkor Thom, the ancient royal city of Khmer Empire with its centre piece; the Bayon temple. As you approach, you will notice the enigmatic faces of former King Jayavarman VII looking into every direction. Your guide will take you to the Terrace of the Elephants, which served as a platform from where the King could welcome back his victorious army and the Terrace of the Leper King, which holds detailed carvings winding along a narrow passage way that leads to the Baphuon complex. This evening, we will get picked up by Tuk-tuk ( or aircon bus ) to experience the arts culture of Cambodia at Siem Reap's 1-hour Phare Circus Show and see the famous artists of Phare Ponleu Selpak Artistic and Social Center from Battambang perform a blend of modern theater, music, dance, acrobatics, and more. The day is started with a visit to the picturesque Ta Prohm. This temple is considered to be Angkor’s most beautiful structure and is overgrown with fig trees, giving a haunting yet exotic atmosphere. The magnificent roots of the trees have merged itself over the centuries with the temple’s huge stone blocks, emphasizing a ‘forgotten city’ feeling. Return to Siem Reap and visit L’Artisans d’Angkor, an organization focusing on training unschooled rural youth in traditional handicraft skills. Here you can discover traditional Cambodian handicraft skills and observe the artisans at work. Enjoy a rest and depart in the afternoon for the jewel of Khmer art, Banteay Srei temple. Translating to “The Citadel of the Women”, this red sand-stone temple is one of Angkor’s most significant structures as its walls are decorated with elaborate carvings and in an amazing state of preservation. Much of the Angkor civilization can be learned here by studying the remarkable carvings. We will drive to the floating village of Choueng Kneas village, where you will take the boat to visit the way of life Cambodian poor people along with schools, restaurants, hospitals and much more floating on the great lake of Tonle Sap. You many even see enterprising children floating in buckets selling soft drinks and floating pig pen. We also explore the local market and artisan D’Angkor workshop. Back to the hotel at noon time. Check-out. Have lunch at a local restaurant. After lunch, you will enjoy your own leisure or shopping. Transfer to Siem Reap airport. Take a flight to Hanoi. Upon arrival in Hanoi, you will be met a driver and transferred to your hotel. Pickup at your hotel and start the city with ochre-colored French colonial buildings, tree-lined boulevards and scenic lakes, Hanoi is full of charm. Start the tour at the historic Ho Chi Minh Mausoleum, an imposing monument lavishly built using marble and granite, and where the preserved body of “Uncle Ho” resides. (Ho Chi Minh Mausoleum is closed every Monday & Friday, all afternoons and from early September until mid November). A short walk from the mausoleum is Ho Chi Minh's stilt house & the lotus shaped One Pillar Pagoda – resting on a single stone pillar emerging from the water. Wind your way afterwards to the Temple of Literature, the first University for the sons of mandarins, for an overview about Hanoian culture and appreciation for ancient Vietnamese architecture. Enjoy lunch at a local restaurant in the afternoon, visit the serene Museum of Ethnology is a 20 minute drive out of town that offers a fascinating insight into Vietnam’s 54 ethnic minority groups (Museum of Ethnology is closed on Mondays). Drive back to central Hanoi for a walking tour through the Old Quarter to enjoy the bustling local life, then cap off the day with a show at the water puppet theatre - a uniquely northern Vietnamese art form depicting scenes of rural life and episodes of national history. Back to your hotel. Note: the cruise program is subject to change without prior notice due to the weather condition or wind direction. 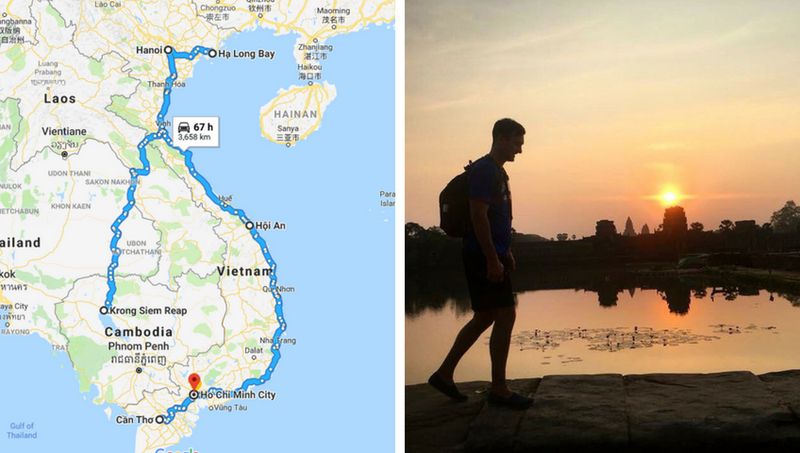 Depart for a 3 hour journey to Halong Bay stopping for a break at Dai Viet Center – the best place to stop and stretch your legs en-route. On arrival in Halong Bay, board your junk, settle into your cabin and prepare your appetite for an enjoyable buffet lunch on deck. Then explore Sung Sot grotto where stalactites hanging from the high ceiling takes on numerous shapes and forms. 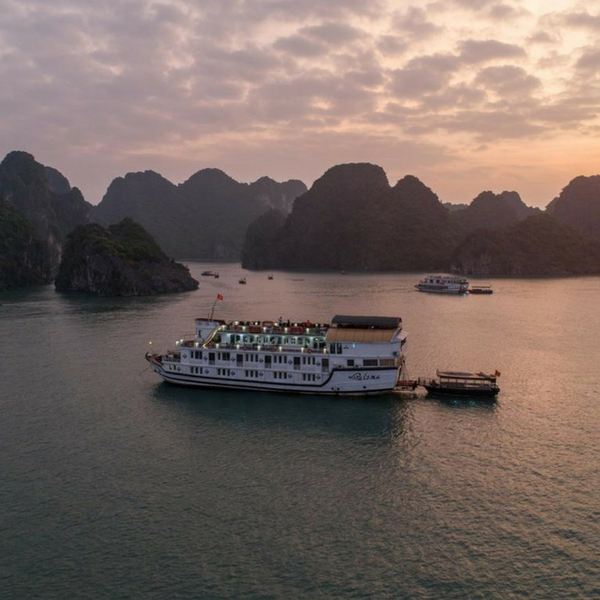 Later this afternoon, stop for swimming or hiking at Titop island where you give you a chance to view panorama view of Halong bay from the top. Before dinner, attend the chef’s cooking demonstration and try your skills in the art of traditional Vietnamese cooking. Early birds can attend a Tai Chi demonstration on the sundeck at the break of dawn. Start the day exploring Luon cave by local rowing boat. Return to your boat for a full buffet breakfast while cruising back to shore. Arrive at the jetty around 10.30am then transfer back to Hanoi. Transfer from your hotel. Midday, Transfer to Hanoi airport and take the flight to Danang. Upon arrival in Danang, you will be met a driver and tour guide and transferred to your hotel. Take a full day trip to the capital and religious centre of the former Champa Kingdom, My Son. Set in a lush green valley, dozens of red brick towers and sanctuaries dating from between the 7th and 13th centuries provide a breathtaking site. On the way back to Hoi An stop at Tra Kieu, formerly known as Simhapura or the Lion Citadel, that once stood as the capital of Champa between the 4th and 8th centuries. 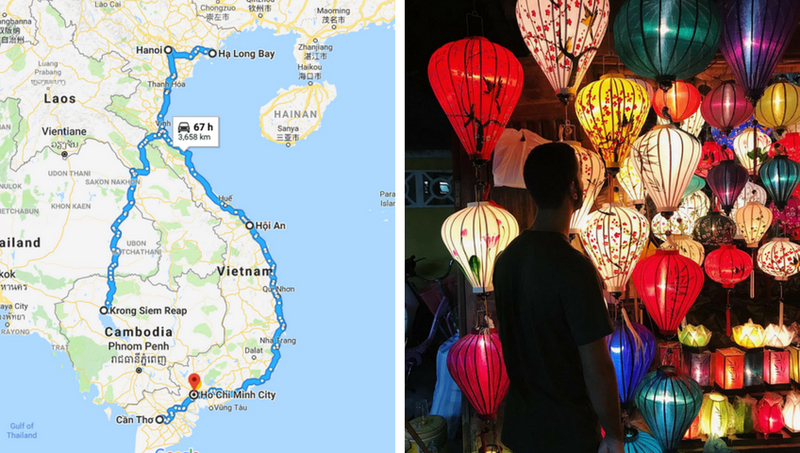 On returning to Hoi An, have lunch at a local restaurantIn the afternoon, take a tour of the ancient town centre to visit the 400 year-old Japanese Covered Bridge Hoi An town, several Chinese Assembly Halls, and some typical Vietnamese houses of the 18 century and the exotic local market. Return to your hotel. Pickup at your hotel and transfer to Hoian. The local tourguide and chef will instruct us to visit Hoi An’s colorful market, and experience the amazing sights, sounds and aromas of this busy market. We will have the opportunity to interact with the local sellers and purchase some of the ingredients to be used in the cooking lesson later. Arrive at the local farm in Tra Que Village. Take a trip around the vegetable garden and join the farmers in preparing the land and fertilising it with seaweed. Continue gardening activities such as raking, sowing, watering greens, picking greens etc. After farming activities you will be shown how to prepare tam huu, a local delicacy before sitting down for a home cooked meal including banh xeo a speciality savoury pancake wrapped in rice paper. The cooking lesson runs for about 1 hours – each dish is first demonstrated by our “chef” before we prepare the same dish ourselves. After the lesson, we sit down and eat exactly what we have cooked. Transferred back to Hoian. Tour guide and driver will meet you at the hotel and Transfer to the air airport and fly to Saigon. Upon arrival in Saigon, you will be met a driver and tour guide and transferred to your hotel. Transfer to the 500-seat Saigon Opera House, or Municipal theatre of Ho Chi Minh to discover the French colonial building and enjoy the Teh Da/ A O show that invites audience on a venture into the enchanting world of Vietnamese highlanders. Wild animal hunts, moonlit romance, jungle's tales of death and reincarnation, are all recreated with stunning bamboo cirque, daring acrobatics, and hypnotizing melody from exotic tribal instruments certified cultural heritage by UNESCO. Meaning ‘going in circle’ in the highland tribe K'ho's tongue, Teh Dar embrace and preserve beautiful and diverse Vietnamese tribal cultures. As the artists keep inspiring, the circle of tribal life keeps going, the cultures shall remain. After culture show, Have dinner at a local restaurant. Back to your hotel. 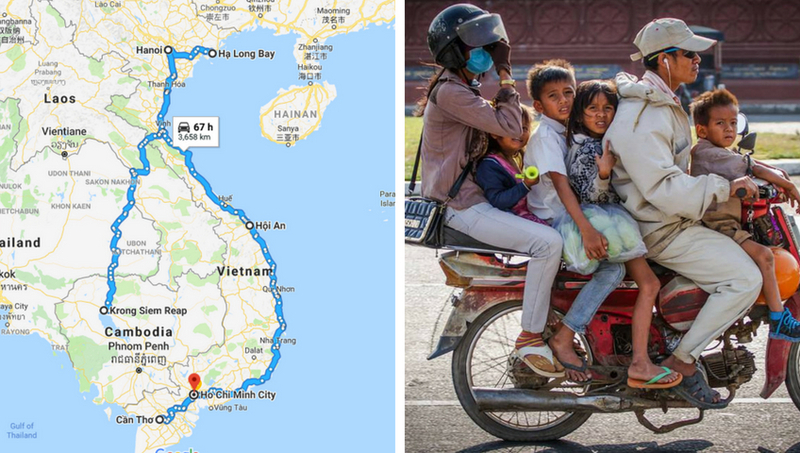 Enjoy a two-hour drive northwest of Saigon, through urbanized areas and typical lush southern Vietnamese countryside, to the famous Cu Chi tunnels. The tunnel complex was initially started in 1948 to protect the Viet Cong guerrillas from the French air and ground sweeps. The tunnels also served as communication routes, storage facilities for food and weapon caches as well as hospitals and living quarters for guerrilla fighters throughout the American war. A visit to the underground villages will provide a better understanding of the tunnels’ history, the hardship of life in the tunnels and the Vietnamese resilience during combat. Continue the city tour to admire Saigon’s historic landmarks including the Notre Dame Cathedral, a red brick edifice with twin spires based on the original construction from Paris (It is only possible to visit inside when no service is being performed). Then head across the square to the Central Post Office, designed by the French architect, Gustav Eiffel. Continue to visit the former Presidential Palace, the headquarters of the Saigon Government during the American war, revealing the history of Saigon during its turbulent recent past. Further, drive to visit the War Remnants Museum for a vivid insight of the American war through the local’s eyes (Please note that some of the photos are very graphic). Back to your hotel. Enjoy a 2-hour drive to explore the beautiful Mekong Delta today! Early this morning drive to Bentre to travel overland through the beautiful countryside of the Mekong Delta where we take a traditional sampan boat ride to explore the peaceful waterways. During the boat trip, visit a local cottage industries making bricks, coconut husking factory, orchards…Take tuk tuk or biking along the village roads. In the afternoon, we travel to Can Tho. Overnight in Can Tho. Morning cruise along the Mekong's small and picturesque tributaries by rowing boat where we will visit the bustling Cai Rang Floating Market. Take in the beautiful scenery and watch the locals going about their daily lives along the Mekong canals. Our next stop is Binh Thuy Ancient House - a rare and well-preserved example in Can Tho City of a characteristic Mekong Delta house, we a unique combination of French and Vietnamese design features, a lush garden with a wide variety of plants, which includes orchids and a record cactus. After time for lunch we return to Saigon and transfer to your hotel. oday is the departure day. This morning is free for last minute shopping or sightseeing before your guide and private car meet you at your hotel and transfer you to the airport for your departure flight.